In this sequel to 2010's surprise hit, Greg Heffley, the kid who made "wimpy" cool is back in an all-new family comedy based on the best-selling follow-up novel by Jeff Kinney. (Kinney's "Wimpy Kid" series has thus far sold 42 million books.) 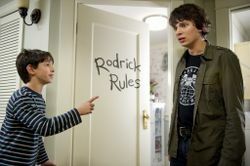 As he begins seventh grade, Greg and his older brother - and chief tormentor - Rodrick must deal with their parents' misguided attempts to have them bond.